We.Stream, is a new initiative of Mondicon, an international mobile data provider that specializes in delivering connectivity in places and situations where this is a challenge. This Dutch company recently opened its office in Santa Monica, California. We.Stream launched the world’s first Secure Mobile Wi-Fi hotspot at CES 2018. 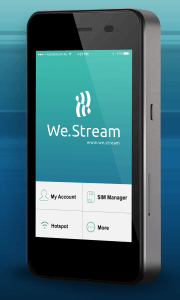 We.Stream is the world’s first Secure mobile Wi-Fi Hotspot with embedded Cloud SIM Technology that enables unlimited data access in more than 100 countries. The embedded Cloud SIM technology enables users to experience the best mobile data rates worldwide. They can easily activate data plans with a single click on the touchscreen of the device. With the built-in VPN solution, travelers can conduct sensitive business online enjoying peace of mind, knowing their data is secure and private. The upfront price point for the device will be $179, which includes 2GB of global mobile data. Frequent travelers can save even more over their current data roaming charges by purchasing We.Stream’s unlimited data plan for only $259 per year.